An image of how the 'We Used To Wait' video appears when the user selects 'Broadway' as their home town. ARCADE FIRE are a band known to push the artistic boundaries – and now they’ve teamed up with a filmmaker to create one of the world’s first interactive music videos, including shots of the viewer’s home town. 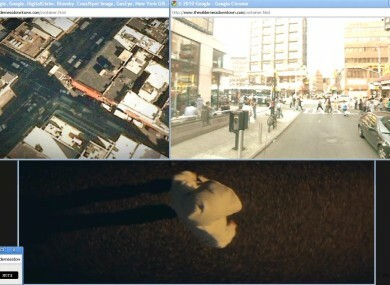 The experiment – called The Wilderness Downtown, and created by director Chris Milk – uses the built-in capabilities of Google’s Chrome browser and the Google Maps service to create a video in multiple overlapping windows. Visitors to thewildernessdowntown.com are asked to input the address where they grew up – and if the Google Maps database has enough Street View images for the area, it will embed images of the town into the video. What’s more, the video is created entirely using HTML5, the latest version of the markup language, which bypasses the need for an embedded video player or extra software like Adobe’s Flash Player. Users are invited at the end to write a postcard to their younger selves which can then be published on the site, adding to the networking angle. If music videos had always been created specifically for the web and not for TV, they may all have looked like this. Unfortunately for Irish users, the absence (as yet) of any Google Street View imaging means the video will revert to default footage, but for anyone with a familiarity of elsewhere, the video can prove a real treat. Email “Arcade Fire team up with Google for new interactive video”. Feedback on “Arcade Fire team up with Google for new interactive video”.